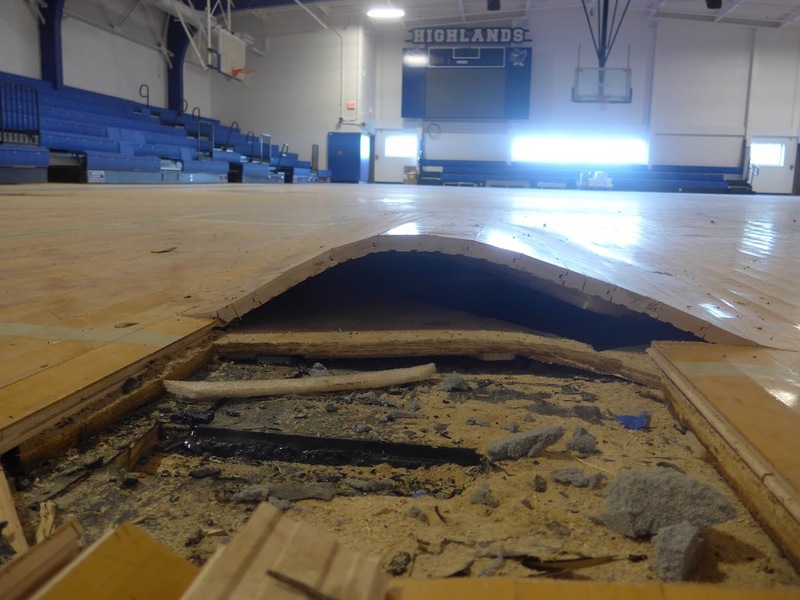 The Fort Thomas Board of Education meets last week to discuss the emergency measure to replace the damaged gym floor. FTM file. Student Showcase: Woodfill Elementary School students Gabe Williams, Chelsea Crisler and Sophia Veshapidze presented their Student Data Binders to the board. This year every student at Woodfill has a Student Data Binder that they use to collect their individual data, like attendance, and set goals for the future. The binders are meant to help the students be successful. The board expressed how impressed they were with the students’ presentation and the work they’re doing with their binders. Woodfill Principal Keith Faust said the binders have been really well accepted by both students and teachers and that he expects the binders will be beneficial for the students. “We really think this is going to pay dividends in the long run,” Faust said. Highlands High School Renovation updates: Director of Operations Jerry Wissman updated the board on the progress of the renovations at Highlands High School. Wissman said work on the field house and gymnasium is progressing and that the field turf project is nearing completion with just a few loose ends to tie up. The insurance company for the contractor agreed to the total the Board asked for to repair the damage to the tune of $211,200. Wissman also presented an update on the renovation of Moyer Elementary School, informing the board that all the necessary project information has been filed with the Kentucky Department of Education, but they had not received approval of the project yet. Wissman said they’re moving forward with what they can for now until they receive KDE’s approval. While a discussion of Moyer’s groundbreaking ceremony was on the meeting’s agenda, Superintendent Gene Kirchner advised they hold off on making plans until they hear back from KDE. Amount: $23,810,000; Expected Sale Date: 10/28/2015. Opinion: Moody's Investors Service has assigned a Aa3 enhanced rating with a stable outlook to Fort Thomas Independent School District Finance Corporation's (KY) $23.81 million School Building Revenue Bonds, Series 2015C, provided by the Kentucky School District Enhancement Program. • Downgrade of the intercept's programmatic rating from weakening of notification and timing provisions, weakening of KY Department of Education oversight. KETS Offer of Assistance: The board approved the School Facilities Construction Commission’s KETS offer of assistance of $24,499. The assistance, which is part of the Education Technology Funding Program, must be matched by the district. Tuition policy change: The board approved the first reading of changes to the district’s tuition policy. Assistant Superintendent Jon Stratton said the only change to the policy is adding the student’s overall educational record to the criteria used when determined whether or not to admit a nonresident student. “This will allow us to give a more objective look at who we let in,” Stratton said. He also noted that the district is still taking applications for tuition students. Update on late arrival/extra PD day: Assistant Superintendent Ginger Webb asked that the district’s principals share with the board how they have been using and plan to use upcoming late arrival days and professional development days. They reported that the time is used to work on various things, including analyzing assessment results and data, coming up with an action plan to continue to improve and move forward and working together on the district’s digital conversion efforts. As a whole, Webb said the Fort Thomas Independent Schools saw an increase in score from 81.5 to 82.5 and are ranked number 1 out of 173 districts in the state. Hall of Fame induction recognition: Before the meeting ended, Board Chair Karen Allen took a minute to thank everyone involved in the first Highlands Hall of Fame induction, which took place Sunday, Oct. 11.